SUMMARY: His father is dead. His mother, an institutionalized addict. Mickey lives with his uncle, whom he barely knows and doesn't really like. Now his girlfriend Ashley, the one bright spot in his life, is missing. As Mickey investigates, he realizes how little he really knew about Ashley and how much danger she is in. ROMANTIC HEAT: Cool. It's clear two of Mickey's female friends have a crush on him, but Mickey does not reciprocate or even seem to realize it. Since his girlfriend Ashley is missing right from the beginning, romance exists, but only just barely. WHAT I LIKED: Years ago, I took a detective fiction class as an elective for my undergrad degree. As an English major, I thought it would be a nice break from all the classic literature I read for my other courses. While I did well in the class, I learned that detective fiction isn't really my thing. So while I did enjoy Shelter, I didn't personally love it as much as my students do. And, oh, do my students love this book! It is one of my go-to picks for students who don't seem to like anything. My amazing aide added Shelter to our picks for our school's Lone Star Plus Reading List this year. We have five copies, which have enjoyed heavy checkout and rave student reviews all year. The sequel Seconds Away has been equally popular. Shelter starts with a bang, and the action does not stop until the very last page. Mickey does not start out intending to take on the role of detective; he just sees that the clues about Ashley's whereabouts aren't adding up. As he delves deeper, the clues get more and more bizarre, leaving readers guessing the whole time. While some parts of the mystery are resolved in Shelter, plenty of other questions present themselves, leading into Seconds Away. Coben has created a cast of interesting characters that readers will care about, particularly Mickey, Ema, and Spoon. True to the hard-boiled detective genre (see, I did learn something in my class! ), Mickey narrates the story with some cynicism. He's seen a lot, both good and bad, in his life, and things have not been easy for him lately. Organized crime is prevalent, and Mickey quickly learns that he cannot trust the police. I especially love how the social hierarchy of Mickey's new high school means nothing to him. While he enjoys a pretty face, he is not interested in shallow mean girls. He befriends Ema (an overweight goth girl) and Spoon (a scrawny, fact-obsessed boy) easily and without worrying about social repercussions. Mickey repeatedly puts himself in dangerous situations to save his friends, and they do the same for him. WHAT I DIDN'T LIKE: The story is generally implausibile. Mickey and his friends are always able to outsmart/out-muscle the bad guys, even though the bad guys are older and have plenty of guns, huge bodyguards, sheer numbers, and a crime network on their side. While it makes for an exciting story, it isn't exactly believable. Also, I don't like the "bad cop" stereotypes that are so prevalent in YA literature. My husband was a police officer before he became a teacher, so I know lots of police officers. The vast majority are good people who work hard doing a necessary and dangerous job. It always makes me sad to see how news, books, music, and movies do such a thorough job of sensationalizing a few bad seeds and making all police officers look like they can't be trusted. THE BOTTOM LINE: Fans of mystery or detective fiction will love this book, and I frequently recommend it for resistant readers (those who can read well but choose not to). A must for any middle school or high school library. 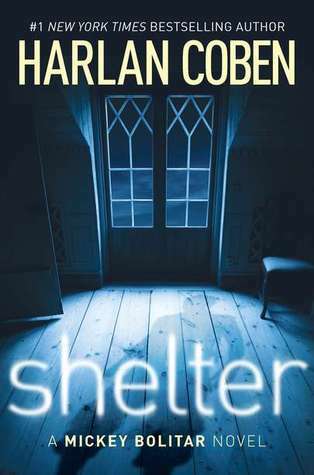 STATUS IN MY LIBRARY: We have 5 copies of Shelter, all currently checked out with one hold request pending. We have 2 copies of Seconds Away, with one currently checked out. The publisher's book trailer (see below) is professionally done, and it also helps drive checkout.